In the first phase of his career from 1880 to 1893, Le Sidaner cultivated a sentimental realism, influenced above all by Bastien-Lepage, with scenes marked by the presence of death and religious mysticism, children in cemeteries, the last rites, orphans out walking, etc. In 1894, having spent ten years in retirement in the North, with long periods in the small port of Étaples, the painter returned to Paris and renewed his association with the artistic world of the capital. This was when the Symbolist Movement was at its height with its inherent hostility to mere material description and the exaltation of anything insinuated, dreamlike or mysterious. Le Sidaner immersed himself in this environment, moving towards Lévy-Dhurmer, Aman-Jean, Henri Martin and other "painters of the soul". This phase reached its peak in 1898 with his discovery of the city of Bruges, known as the "dead city" in the famous novel by Georges Rodenbach. The present work dates from his Symbolist period and can be compared, in both style and motif, to certain paintings by the Spanish artist Darío de Regoyos. Le Sidaner resorts to a dramatic device that he frequently deployed, leaving the foreground empty. In this case it is the area in front of the wall, which contrasts with the dense space of the garden where the houses are barely visible, partially hidden by the trees. Le Sidaner was always attracted to gardens at twilight, enveloped in the tenuous light the Symbolist writer Camille Mauclair praised as one of the most evocative features of his painting. The setting autumn sun caresses the tree-tops, giving them a gentle sparkle. 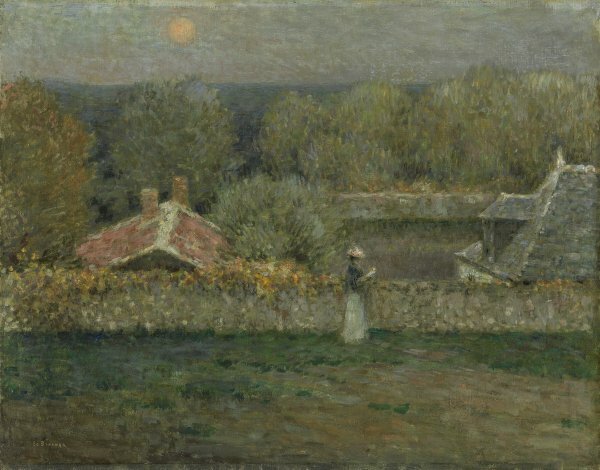 The pale stippling on the stone wall and greenery indicates the influence of Seurat, even though Le Sidaner never shared his neo-Impressionist search for full sunlight through the contrast of pure colours. He preferred a gentler range of tones with the harmonies softer and blended. The silence, the loneliness, the drawing-in and the intimacy of the hour are all expressed in the woman who walks across the foreground area, immersed in her reading.